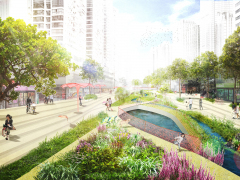 Proud to be selected for the international competition for the Shenzhen Buji River regeneration! Together with MLA+ and local urban planning firm GZUPI, we are going to work on a accessible and vital (waterfront) design for the 9,77km Buji River in Luohu District. The river needs to function as flood controller of the city and perform as a connected urban realm. Great challenge ahead!